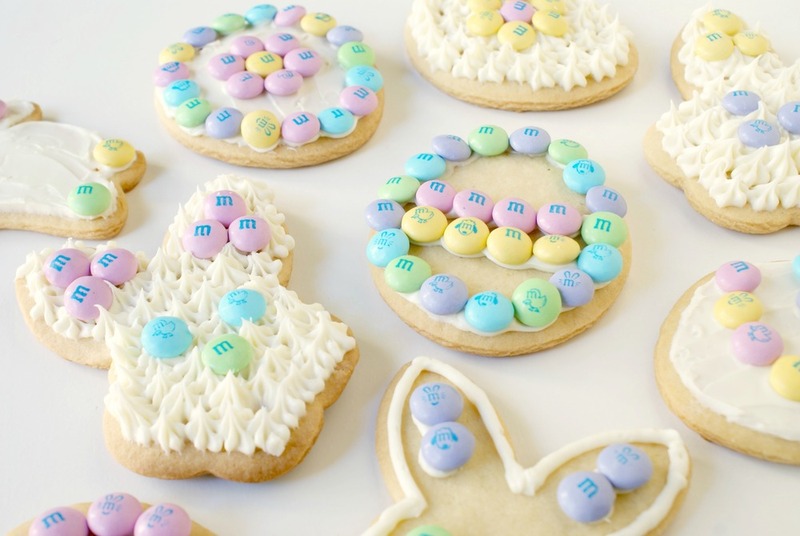 Easter Cookies are adorable bunny and egg-shaped cookies that are decorated with sweet vanilla icing and M&M'S® Brand Milk Chocolate Candies Bunny Mix. If you're anything like me, you like to make the holidays special for your family and friends by creating fun themed foods to help celebrate throughout the year. Food equals love in my book and creating memories in the kitchen with my family makes me one happy momma. My daughter loves to don her chef's hat and apron and I love seeing the smile on her face as we prepare meals and uphold baking traditions. One of our favorite traditions is to decorate cookies to coordinate with every occasion. I have a slew of cookie cutters I've collected throughout the years that I look forward to passing on to my children one day so that they can continue to make memories with their own families. 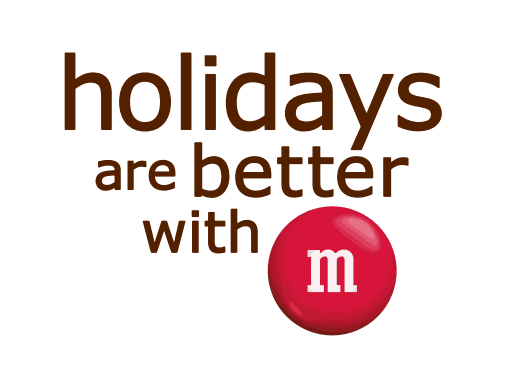 This year I am making Easter Cookies using a recipe from M&M'S® Brand Chocolate Candies. 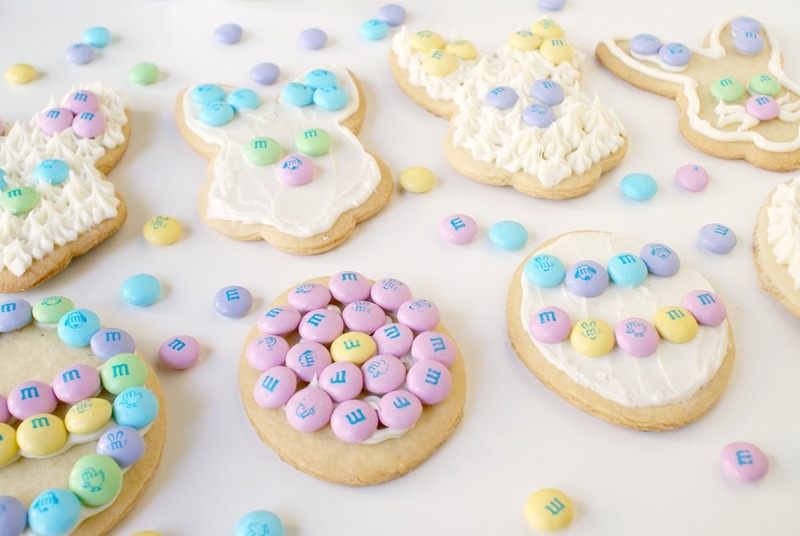 These adorable bunny and egg-shaped cookies that are festively decorated with vanilla icing and M&M'S® Brand Chocolate Candies Bunny Mix will be perfect to prepare with my little lady as my kitchen assistant, and to give as gifts to our relatives this Easter. The recipe uses premade cookie dough and frosting, so we can really focus on our favorite part....the decorating. M&M'S® Brand Chocolate Candies Bunny Mix are the perfect decorations for making our sweet treats extra fun. Visit www.bakingwithmms.com for more creative ideas and inspiration. Bake Time: 12- 17 min. Preheat oven to 350°F. Line the cookie sheet pans with the parchment paper. Knead the flour into the cookie dough until smooth. Roll out the dough to a scant 1/4-inch thickness. Cut out cookies, re-rolling the scraps if necessary. Transfer the cookies to the prepared cookie sheet pans. Bake for 12-17 minutes, or until golden brown. Remove from the oven, transfer to a wire rack, and let cool completely. Spoon the frosting into a resealable plastic bag; snip a corner. Using the photo as a guide, pipe outlines on the cookies, then fill in the outlines with a tight zigzag pattern. Spread the frosting with a small spatula or table knife on about half the cookies to make it smooth. Decorate with M&M'S® Brand Milk Chocolate Candies Bunny Mix to make fun designs. This is a sponsored conversation written by me on behalf of MARS. The opinions and text are all mine.